The term 'silica' can be misleading. It is important to understand the difference between 'silica mineral', 'silicates', and 'silica glass'. Quartz is the best example of a natural mineral that is almost pure silicon dioxide (it is the most abundant mineral on planet earth). Other ceramic minerals like feldspar and clay contain some 'free silica' (accessory quartz). However these also usually contain 'silicates', that is, SiO2 chemically combined with other oxides to form crystalline minerals. Other silica-containing rocks and minerals are andalusite, barite, beach sand, bentonite, calcite, diatomaceous earth, kaolin, limestone, mica, pyrophyllite, talc, tripoli, rutile, wollastonite, zeolite, zirconium sand, vermiculite, granite, and sandstone. Silica is also available as a silicate glass (in frits). Pure silica minerals (like quartz) have high melting points. In ceramic bodies and glazes other oxides are added to complement it, they form silicates with it or occupy the network between particles of quartz. In the latter case silica is considered a 'filler' (e.g. porcelain clay bodies). It is interesting that some special purpose (and expensive) clay bodies replace the silica filler with calcined alumina, this increases body strength and reduces thermal expansion. Individual particles of quartz have a high thermal expansion (and associated contraction) and significantly change their volume as they pass up and down through 'inversion' temperature points during firing. This can cause a form of body cracking called 'dunting' (because only some of the silica gets dissolved in the feldspar glass melt). The cracking occurs as micro-cracks radiate out from each microscopic particle of quartz and propagate into larger cracks. High quartz bodies are usually unsuitable for ovenware and ware that must tolerate sudden temperature changes. However this behaviour is advantageous to glaze fit since it puts the 'squeeze' on the glaze to prevent crazing. At the same time silica in glazes tends to dissolve and form low expansion silicates that reduce glaze expansion and also prevent crazing. In both cases, silica powder of small grain size is advantageous. While it is convenient to think that quartz particles dissolve in the glaze melt to combine with other oxides to produce silicates reality can be quite different. 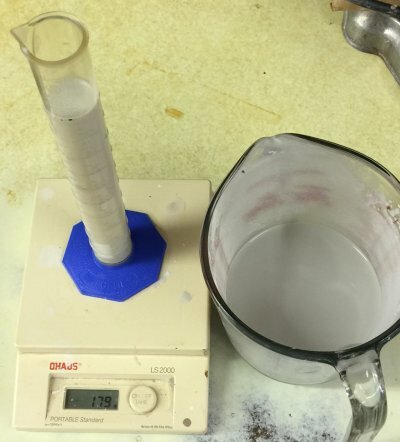 As noted, quartz particles do not melt at any common ceramic temperatures, they must be dissolved into the melt by other things that have already melted. The completeness of this obviously depends on time, temperature and fluidity and nature of the melt. Potters, who fire slowly and at high temperatures, are least affected by this issue (those firing low and fast most affected). But in industry, where firings are one or two hours, SiO2 must often be sourced to the glass by frits or raw materials that release it more easily (like feldspar, wollastonite, pyrophyllite). A typical high temperature stoneware glaze for potters might have 30% silica whereas a fast-fire industrial glaze would often have none. 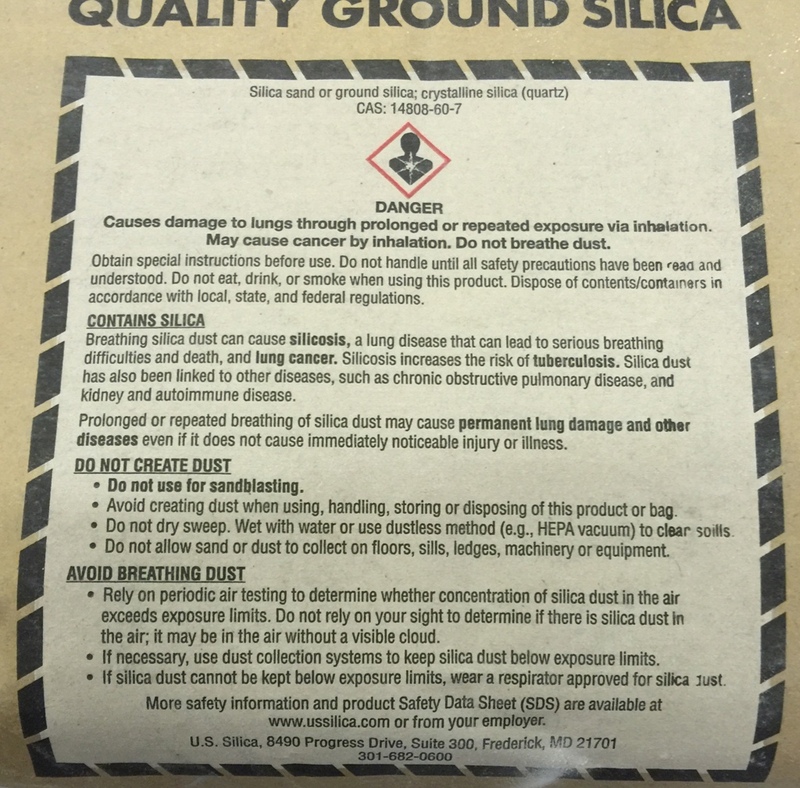 If you are fired at low temperatures, it is best to have zero silica also, source the SiO2 from other materials. High temperature traditional ceramic bodies tend to have up to 30% silica whereas low fire ones have much less or none (because of its refractory nature). However in recent years many companies substitute kyanite, pyrophyllite or similar minerals for part of the quartz to minimize thermal expansion (see article in Studio Potter vol 28 #1 by Peter Sohngen). Apparently very fine grades of silica aid in cristobalite formation in stoneware bodies (cristobalite is a form of silica that goes through it's inversion at about 200C). When limestone and silica are available in a body they can react to form wollastonite. This adds mechanical strength and is exploited in tile bodies. For optimal results the relative percentages must be in balance and the forming and firing methods tuned to optimize the effect. High temperature glazes can have 40% or more silica at times, if enough flux is available to react and form silicates. What would happen if you made a body from 50:50 kaolin:ball clay? It would craze glazes! This is fired at cone 6 and the crazing was like this out of the kiln. This is about as bad as I have ever seen. One might think that there is adequate quartz in this high of a percentage of ball clay to at least minimize crazing, but no so. 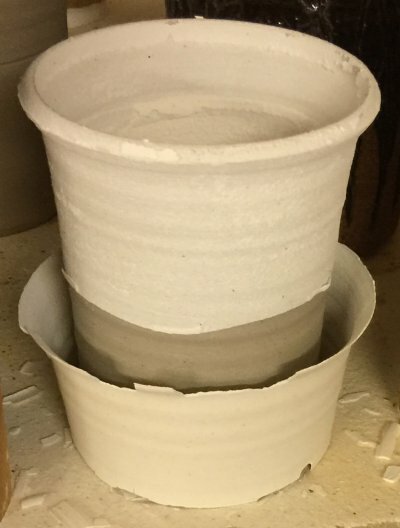 This demonstrates the need for adequate pure silica powder in stoneware bodies to give them high enough thermal expansion to squeeze glaze on cooling to prevent crazing like this. This is also not proving to be quite as refractory as I thought, it looks like it will have about 3% porosity at cone 10. A pure silica suspension that behaves like a glaze. Is that possible? Yes. This slurry is just water and 295 mesh silica. I have mixed it to 1.79 specific gravity and it is creamy. It applies like a glaze to bisque ware (if I dip it fast) and goes on super smooth and even. It does settle, but only slowly. Unlike feldspar and nepheline syenite, if I thin it a little and add powdered epsom salts or vinegar it does not gel, no matter how much I put in. The only response I can see is that it appears to settle out a little less. I was always taught that clay is needed to suspend things, every thing else will settle out like a rock if there is no clay present in the slurry. Of any material, this is one that I would have expected to settle out the fastest. The silica pants of this cone 10R mug have fallen down! This stoneware mug was glazed inside and halfway down the outside with pure silica. At some point during heatup the outside layer, not shrinking like the piece, simply fell down. And was sintered enough to hang together and remain intact through the rest of the firing (on the inside, the shrinking forced the silica to flake off into a pile at the bottom). Cone 10 has sintered the silica enough that it will not slake in water but it is fragile and soft and must be handled carefully. The principles behind formulating a porcelain are quite simple. You just need to know the purpose of each material, a starting recipe and a testing regimen.